The Ford VCM 2 and the GM MDI 2 is the next generation Global Diagnostic Interface tool for both current and future vehicles, and extending through future vehicle protocols and architectures. It’s a compact communication module with increased processing power and security that manages the transfer of data between a vehicle’s onboard ECU network with an auxiliary CAN bus. The Ford VCM 2 + GM MDI 2 covers all Ford/GM Makes Models from 1996- Current year. 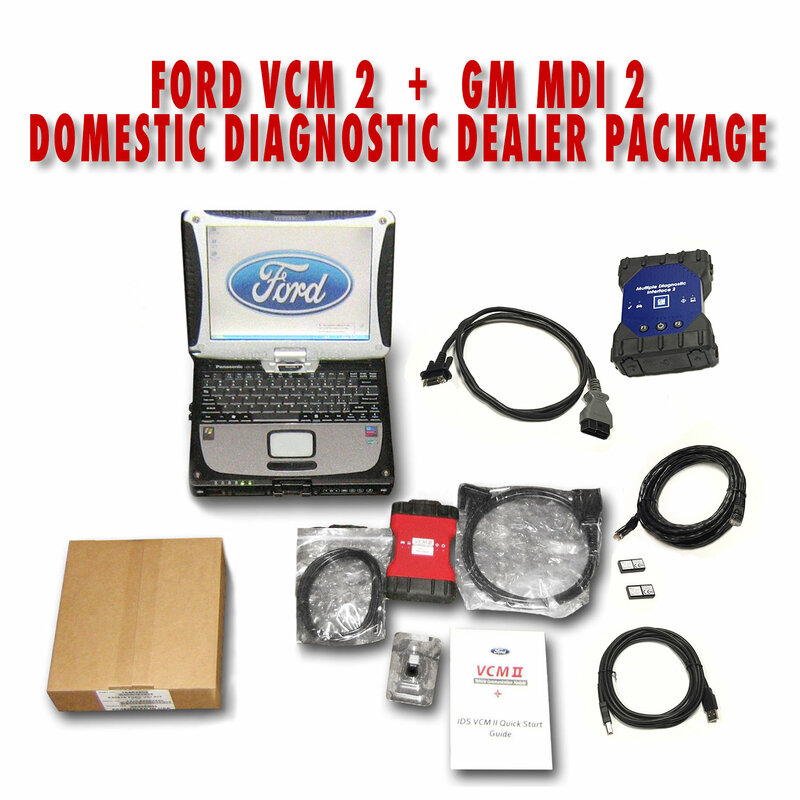 Ford VCM 2 + GM MDI 2 Domestic Diagnostic Dealer Package, This Kit Comes Fully Licensed with Both Ford and GM Software. The GM MDI 2 is the next generation Global Diagnostic Interface tool for both current and future vehicles, and extending through future vehicle protocols and architectures. It’s a compact communication module with increased processing power and security that manages the transfer of data between a vehicle’s onboard ECU network with an auxiliary CAN bus. The GM MDI 2 replaces the MDI introduced in 2007, for Pass-Thru programming and offers faster programming speed than the MDI. The MDI 2 can be used to perform Pass-Thru programming on all GM vehicles built since 1996 and into the future. Servicing the current generation vehicles will require the diagnostic software, GDS2, Global Diagnostic System 2 running on a local PC device while the MDI or MDI 2 is connected to the vehicle. The MDI 2 connects to the vehicle via the J1962 connector using a DLC cable. Connection between the MDI 2 and the PC can be accomplished via standalone (USB) and the dealership network (CAT5). The Dealer Toughbook Package Comes All Set Up Ready to go.